I awoke early in the morning on October 18, 2014 after spending the night at Quaking Aspen campground in Sequoia National Forest. It was a rather cold night I might add! That morning I made my way up to a creek in search of a Kern River rainbow. 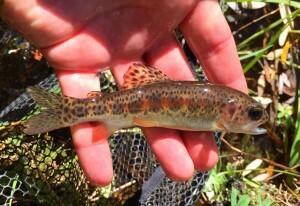 In order to qualify, the trout needed to be caught in the Kern River, or its tributaries, above Durrwood Creek. Since I didn’t have time to hike a few miles down to the Kern River, which is a full day adventure, I had to spend my time at the upper part of the creek where it was close to the road. Thankfully I caught a small one late that morning!